Hale & Hearty present a unique instrumental duo, featuring creative arrangements of music from diverse sources alongside original compositions. 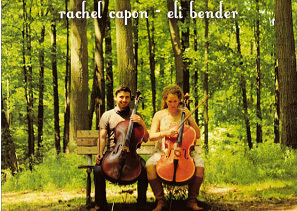 Comprised of cellist Rachel Capon and cellist/multi-instrumentalist Eli Bender, this duo draws influence from folk, pop and classical music resulting in an original and elegantly distinct sound. You will hear ancient folk tunes to newly composed works, from the Appalachian Mountains to the Islands of the Pacific.